AMD didn’t pick the best possible time to launch its upper mid-range Radeon RX 590 GPU. 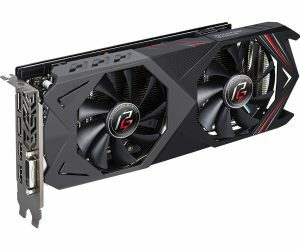 Now it has to compete with Nvidia’s more efficient GeForce GTX 1660 Ti in a similar price range, on top of the now-discounted Radeon RX 580 cards, which aren’t that much slower. On the plus side, this segment is really the buyer’s market right now. The strong competition has driven down prices across the board. 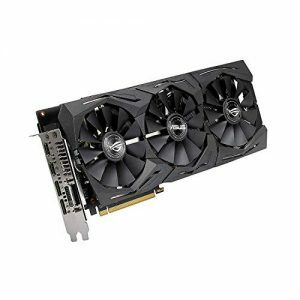 It’s already possible to find this card at prices that undercut the GTX 1660 Ti by a fair margin. And there’s no question that the RX 590 is an attractive GPU. Although it’s based on the same Polaris architecture as the RX 580, the 590 is more than just a simple rebadge with a slight clock increase. It is manufactured with a smaller (12 nm) production process, which has allowed AMD to increase the default boost clock by more than 200 MHz. Theoretical performance (FP32 float.) is up from 6,175 GFLOPS (RX 580) to 7,119 GFLOPS (RX 590). In comparison, the reference GTX 1660 Ti churns out 5,437 GFLOPS. The bad news is that this isn’t necessarily reflected in actual games. Also, power-efficiency in the Radeon lineup is still far behind the latest Nvidia cards. However, it’s a relatively close competitor as measured in frames per second – and if the price is right it’s still a great choice for both 1080p and 1440p gaming. It gets better still combined with a FreeSync monitor. So let’s move on to the top cards in the category. Actually, this is about half of the total number of cards with this GPU available at the time of writing. We’ve sorted them based on opinions from both professional and users reviews, as well as our own experience with similar cards. Click through to our database entries of the different models to find links to reviews and other information. 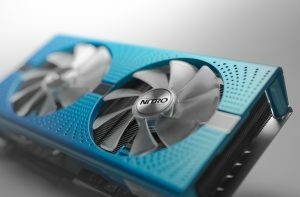 Sapphire’s Nitro+ series is the manufacturer’s premium graphics card lineup, with the most advanced cooling solution and often a liberal amount of factory overclocking. The Nitro+ is no exception – even the card’s 8 GB of memory (VRAM) is boosted out of the box, making this card a rarity in the segment (possibly unique). Compared to the reference model, the Nitro+ GPU boost clock is up from 1545 MHz to 1560 MHz. The VRAM clock is increased from 2000 MHz to 2100 MHz, resulting in an effective 8400 MHz instead of 8000 MHz. Like other Nitro+ cards, this one also an efficient cooling solution with replaceable fans. It also takes up no more than two PCI slots, whereas most competitors use triple-slot options. Professional reviews of the Nitro+ are mostly in agreement that it’s one of the best cards, if not the best. XFX’s Fatboy is one of the best-selling variants of the card, and not without reason. Like the aforementioned Sapphire card, the Fatboy is factory overclocked. While the memory clock is untouched, the GPU boost clock is actually a bit higher still, at 1580 MHz. This gives you an extra 2% worth of GPU core performance out of the box. The Fatboy’s dual-fan cooling solution takes up three PCI slots internally. XFX has equipped the card with a Unibody VRM Heatsink, which increases the heat sink surface considerably, according to the manufacturer. The card also has an aluminum backplate to improve rigidity and help with heat dissipation. 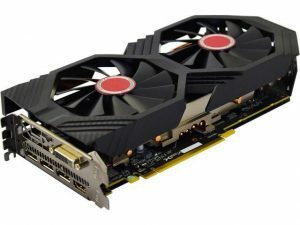 XFX has picked up generally favorable reviews of the RX 590 Fatboy. PowerColor’s take on the latest AMD Polaris chip is also overclocked out of the box. The reference model’s 1545 MHz maximum GPU boost clock has been increased to 1576 MHz – higher than the Sapphire Nitro+ but marginally lower than the XFX Fatboy. Like the XFX model, the PowerColor Red Devil RX 590 OC is equipped with a dual-fan cooling solution that is rather large and occupies three slots. Anyone who enjoys tinkering with their GPUs will be happy to learn that the Red Devil has a dual BIOS setup. A switch on the card lets you toggle between the two presets ‘Ultra Overclocking’ and ‘Silent Overclocking’. Opinions on the Red Devil are mostly positive, although there are some questions raised regarding how it handles temperatures and power consumption. Products in the ever-popular ROG Strix lineup from ASUS tend to breathe quality and come with premium features, but also a price tag to match. The Strix checks all of these boxes including the last one, which is why we’re not rating it higher. As a mid-range card based on the Polaris 30 GPU, the ASUS model is simply not competitive at MSRP. ASUS has also applied a slight overclock of the GPU boost clock, from 1545 MHz to 1565 MHz, but the VRAM is untouched. Considering the extra fan compared to the other models, there’s a potential for more headroom for a user overclock – to squeeze even more performance out of the card. However, the main selling point for most potential buyers of this expensive card is probably the Aura Sync feature. If you’re building an ASUS ROG-based gaming rig, the RGB lighting scheme will make this one hard to pass up on. We haven’t seen many reviews of the card, but most users are positive. If you don’t want to tinker with the GPU yourself and want the highest possible factory overclocking instead, the ASRock Phantom Gaming X Radeon RX 590 is an attractive option. ASRock has been very generous with the GPU boost clock, and as an added bonus it’s a dual-slot card. Compared to the reference model, ASRock has pushed the GPU boost clock from 1545 MHz to 1591 MHz in the Phantom Gaming X, in ‘OC Mode’. This also increases the card’s VRAM very slightly, from 8000 MHz (effective clock) to 8032 MHz. Cooling is handled by two fans in a compact dual-slot solution that doesn’t take up unnecessary space. On the downside, this has also made the card quite loud according to some tester. 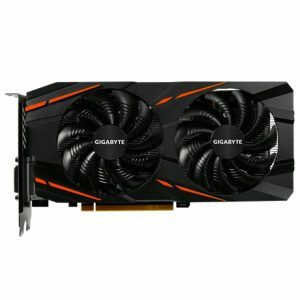 Gigabyte has used this exact same Windforce cooling solution on several GPUs in the past – and why change a winning formula? The 590 Gaming 8G was late to the party and we’ve found no professional reviews of the card yet. But since it’s practically identical to the RX 580 Gaming we have in the basement, we’ll vouch for it anyway. In OC mode, the GPU boost clock is increased to 1560 MHz, or 1% compared to the reference design. Like the card’s predecessors and the ASRock and Sapphire alternatives mentioned above, it’s a comparatively compact, dual-slot card suitable for similarly compact gaming PC builds. Much like Gigabyte’s model, MSI has reused an existing board design and cooler for the 590 Armor. This one is also a relatively simple dual-fan solution in a dual-slot form factor. It’s available in both a factory overclocked model (OC) and without the overclock. The difference in the OC version is that MSI has increased the GPU boost clock to 1565 MHz, or just over 1% compared to the standard variant. On the whole, it’s a no-frills card based on a tried-and-tested design from a reputable manufacturer, so there should be few surprises here. Ever since the RX 480, which used the first and less efficient version of the same Polaris chip, undervolting has been a topic of much discussion. A problem with Polaris – especially when compared to Nvidia’s lineup – is poor power-efficiency. Although this is the best version so far, it is still less efficient than the GTX 1060 and even more so than the GTX 1660 (Ti). Therefore, reducing the voltage to improve the efficiency of the chip used to be a popular tactic among crypto miners. But it’s also useful for gamers. It will keep the temps to a minimum and reduce power draw, often without reducing performance. If you’re interested, take a look at this walkthrough from Wccftech that explains the process. 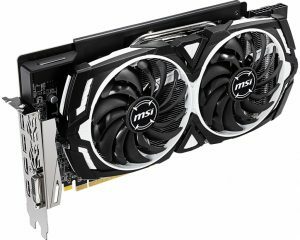 The RX 590 may have been launched at a bad time, but it may still be a great choice for a mid-range build. Prices are already down significantly since launch, so it’s still competitive with the Nvidia alternatives. However, the price tag should determine whether it’s the best choice at any given time. Factory-overclocked cards are generally not worth a premium based on the higher clocks alone, but may have other advantages such as better cooling. 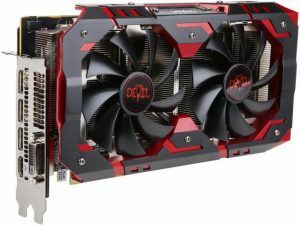 If this card is not in your price range at the moment, also have a look at our roundup of the best AMD and Nvidia cards below $200.